One of the nice things about Chain of Command is that putting together a force large enough to play the game is very easy indeed. A platoon of infantry plus supports is not expensive and there are not a lot of models to paint if you just want to get a basic force on the table. 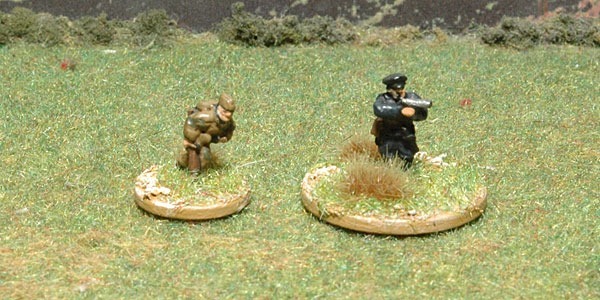 Especially if you use 15mm figures like I do. When I read the full version of the CoC rules for the first time and saw the platoon structure, special rules and support option for the Russians they looked interesting and likely to give a completely different game to the 1944 British that I’ve been playing so far. They have a national characteristic that makes any pre-game bombardment very effective at keeping the enemy disrupted while the Russian infantry get in close. 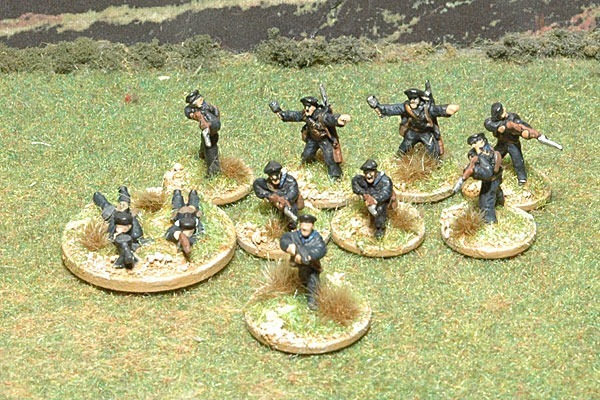 In a box in my study, where they’ve been sitting unused for about six years, I knew I had some Russian naval infantry that I’d painted up to use to play the Russian Civil War version of Square Bashing from Peter Pig. Counting them up I found I had enough to put together all the riflemen needed for a platoon, with an extra of infantry and two Maxim Gun teams as support. All I needed to do was rebase the models I had and add an LMG for each section and SMG armed NCOs. 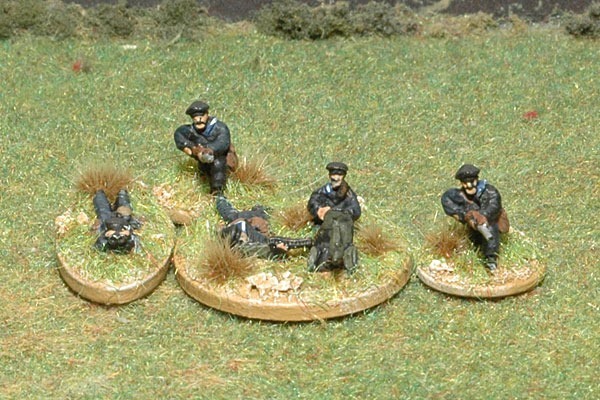 I also bought some of their Russian Scouts, so I could put together a squad of Razvedchiki as a support option. These troops count as elite in CoC and have a special rule that allows them to move quickly whilst maximising their use of cover. They look like an excellent option to have available. Delivery from Peter Pig was incredibly fast, the troops showed up under two days after I ordered them, and I got them all finished in under a week. Here they are. Razvedchiki – the squad NCO is wearing one of the one piece camouflage suits used by Russian scouts and snipers. He’ll get a naval cap to wear when I buy some Russian sailor heads in my next Peter Pig order. I’ll need them to covert other planned supports such as ATR teams which Peter Pig do not provide for their naval infantry. Getting that lot together took me just over a week and cost about £10. I’ll be expanding them in the future, they need some sort of anti-tank capacity and an AFV or two would be fun. I’ve already bought a Zvezda T-26.